I have a noob question, on the cheapest and easy way to make sequential tail lights that have 10 steps. I have searched the net and have found 3 step ones for 30+ and any of the 10 step ones are 130 each. If I could find one that is 12 volt and has 10 steps that is not 130 that would be great. I'm not the best at electronics, so easy on the terminology. There are 9 volts ones all over the net but I don't know if they will take 12-14.4 volts from a vehicle. If anyone can help please let me know. It's very easy to use a counter to sequence any number of lights you want. The voltage is just a matter of using appropriately rated transistors to control the lamps and use a regulator to supply power to the logic. Sorry James that is way above my head, if you could point me in the right direction of if they sell them at a electronics web site or a video on how to build one with what I would need? If you have a 9V light, then run it off a 12V to 9V converter module, which can be purchased fairly cheaply off eBay. But I also want the LED's to be bright. Will that dim them? robjodicarter, I think you're on the wrong forum here. This is for the inner workings of electronics. You'll be much better off on a car-mod forum. Oh ok, sorry I thought this was for beginner electronics. Car mod forums don't have really have electronics people that can explain this to me. 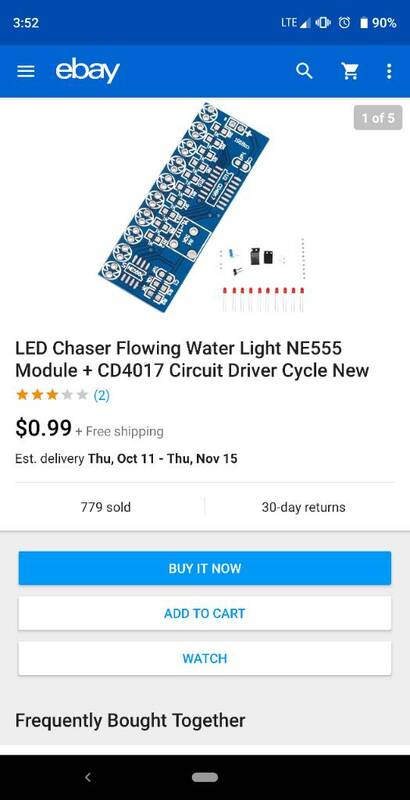 Try searching for "LED chaser" and you should find all sorts of info, schematics and probably some beginner-level tutorials. Many people's first electronics projects involve simple blinking lights. Edit: This isn't what you want. See below. Not if they're designed to work off 9V, in which case powering them directly off 12V could blow them up. Hi Rob, do a search for LM3914 - LM3915 - LM3916 on YT, which might suit your use. This is the first one I found in search. A bargraph isn't really what the OP is looking for. I believe the OP is looking for a simple sequential blinky light, like a counter and a 138 or 154 decoder. Try looking up projects with 74LS161, 163, 138, 154, etc. No, the OP is looking for sequential tail lights with a later reference to the fact that he is not learned in electronics and wants to know more. IMO, it is very unclear as to what the OP wants. My solution might be what is desired and your solution may work as well. Ah, you're right since the OP wants the lower "bits" to stay on, I'm sure... that makes it a trickier counting job and a 138/154 isn't the output arrangement we want... would actually need to see the bits or use shift registers or whatever. I wasn't thinking that through. An LM3914 with a simple ramped-up voltage is just what the doctor ordered. A string of compartors would work in a pinch also, of course, since we don't need the dot mode or any fancy features but a LM3914 is a much easier to wire, simpler solution. Beginners are more than welcome here, however this forum is aimed toward people who want to learn about the inner workings, it's probably not the best place to look for an off the shelf ready to go solution. If you're looking for ideas and willing to take some time to learn then you'll find lots of help here. Otherwise you might be better off looking for suggestions for a ready to go product from a car forum. For someone who is an absolute newbie to electronics, the solutions that drussell and I suggested probably can't be done by a complete newbie, nor would a newbie even understand what we are implying. As seasoned hobbyists or EEs we know at a glance how these suggestions would work. I am waiting for the right response from the OP to see if there is interest in the art or interest in only making LEDs blink. I built one of those a few years ago when I was curious what sort of kit building experience I could get for $1.50. A 4017 only lights one LED at a time though, is that what you want? The 4017 itself will tolerate 12V though and the LED brightness can be changed by changing the value of resistors used to limit the current. An automotive electrical system is notoriously dirty from an electrical standpoint though so I wouldn't expect that to last long without some modifications to bulletproof it. Do they light one at a time until they are all lit and start again or one at a time until it gets to the end? And what would u have to do to make it bullet proof? And thank you !!!!! Hi robjodicarter. Welcome to the forum. First a little warning... We have a lot of expertise on this forum and we are very willing to share it with someone who is genuinely interested - but we don't always get it right matching the information we can share with your abilities at this time. Bear with us and let us know if we've gone "rocket scientist" on you. Also, don't get too scared if two members start having a "discussion" about something you don't understand. We can get caught up in some of the details on occasion. Usually, someone will come along, bring some sanity and get back to helping you out. As for your project, you are quite correct to be thinking about brightness if you are looking to fit something like this to a motor vehicle - but for high brightness, you will need higher current than you can get out of those small single board units. This is going to be one of the reasons why the real deal units are not cheap. They will take something like the board you have shown as a starting point, then add a couple of components and a high power LED to each of those 10 channels. This is something that many people here could help you build, if you feel you want to take on the challenge. It is also possible that there may be a higher powered module already available. If so, someone here might know where to look. Anyway ... bear with us and help us to help you. If things get confusing, please ask questions. Most of us here get our kicks out of seeing someone learn and understand. Have a look at this page: https://fr.wikipedia.org/wiki/Circuit_int%C3%A9gr%C3%A9_4017 It's in French - but you can translate it. That is perfect the center is exactly what I want to make!!!! And I will read that page!!! If I know what to buy I can start ordering what I need and maybe get a class/rundown on how to put it together. I thank you for taking the time to help me!!! I am assuming that when power is applied, you want to have each LED light in sequence but leave every preceding one on, (so you have 1, 2, 3, 4, 5, 6, 7, 8, 9, then all 10 LEDs lit) then stop and stay with all 10 lit once it gets to the end until power is removed, correct? Do you have access to any electronics supplies like a breadboard? Do you know what that is? Are you in school? With a little more basic information, perhaps we can point you to some basic tutorials. Are you in school? And no I'm 41, I'm a mechanic by trade and am in the army since 1996. I know roughly what some components are but not at all savy still a super beginner but willing to learn.